I made a visit last week to the El Comedor Soup Kitchen in Costa Rica. El Comedor (“The Dining Room”) serves lunch to 75+ children and families Monday through Friday year-round. They also serve seniors in the area who frequently don’t have enough to eat. The soup kitchen was founded (and still run) by Doña Margarita in 2000. She’s everyone’s favorite grandmother in the area — and for good reason. 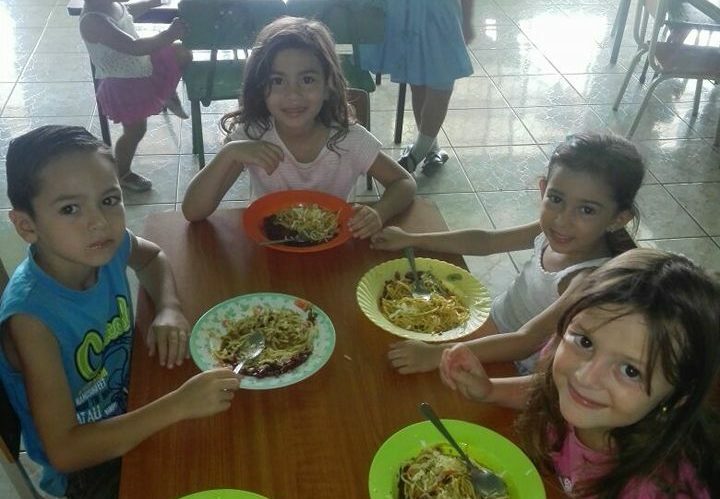 She started El Comedor De Niños Jesús Fundación because she saw the need for it. As Doña Margarita told me, she kept seeing a lot of children going to school without breakfast, with some fathers spending their money on liquor instead. She began by inviting some children and their families into her home for a home-cooked meal. Then word-of-mouth spread, and now 18 years later the (tiny) dining room is packed with families for lunch. And I do mean “home” cooked. El Comedor is literally part of Doña Margarita’s house. She and her family live on the same property as El Comedor — along with some of their best animal friends. The food served at El Comedor is typical Costa Rican fare with lots of rice and beans, potatoes, and fruits like bananas and papaya. Funding El Comedor De Niños Jesús is a constant challenge for the program, as Doña Margarita told me. But they sometimes get donations of money, food and supplies from generous locals. For our part at Cosmic Volunteers, we are committed to sending as many volunteers as possible to El Comedor in Costa Rica. Our volunteers have the opportunity to help prepare and serve lunches here during their service learning trip. Most of our volunteers in the Santa Barbara area of Costa Rica work at full-time placements at schools and day care centers as teachers and caregivers. Then for lunch, they are happy to make the time to regularly volunteer at El Comedor. El Comedor has become a magnet for Costa Rican university students majoring in social work to earn college credit while working with the children of Barrio Jesus. During my visit, several Costa Rican university students were putting together gift bags for the kids. As I spoke to the students about their studies, especially their time at El Comedor, it was clear how dedicated they were to helping these families. They also brought a yummy-looking cake! We are looking forward to many years of volunteering and visiting El Comedor De Niños Jesús Fundación. Getting There: Public bus stop right outside El Comedor’s front door. An Uber from the airport costs $8 USD and takes 25 minutes. Walking is fine too if you’re living local like our volunteers (be careful — sidewalks are scarce). Donations: Doña Margarita graciously accepts donations of cash and food.